ABOUT THE GAMEIn a Desperate War for Earth’s Survival, The Only Way to Defeat the Strogg is to Become One of Them	Earth is under siege by the Strogg, a barbaric alien race moving through the universe consuming, recycling and annihilating any civilization in their path. In a desperate attempt to survive, an armada of Earth’s finest warriors is sent to take the battle to the Strogg home planet.Y… ou are Matthew Kane, an elite member of Rhino Squad and Earth's valiant invasion force. Fight alone, with your squad, or in hover tanks and mechanized walkers as you engage in a heroic mission to the heart of the Strogg war machine.KEY FEATURES Sequel to the epic Quake 2 storyline Battle outdoors using tanks and walkers Fight with the support of an elite squad	Compete online in fast action, arena-style multiplayer Built on the genre defining id Tech 4 (the Doom 3 engine) SYSTEM REQUIREMENTS Operating System: 10.6.8 (Snow Leopard), 10.7.3 (Lion) CPU Processor: Intel Core 2 Duo (Dual-Core) CPU Speed: 2.4 GHz Memory: 2 GB Hard Disk Space: 3.5 GB Video Card (ATI): Radeon HD 2600 Video Card (NVidia): Geforce 8600 Video Memory (VRam): 256 MB Peripherals: Macintosh mouse and keyboard Supported Video Chipsets NVIDIA GEFORCE 8600 NVIDIA GEFORCE 8800 NVIDIA GEFORCE 9400 NVIDIA GEFORCE 9600 NVIDIA GEFORCE GT 120 NVIDIA GEFORCE 320M NVIDIA GEFORCE 330M ATI RADEON HD 2600 ATI RADEON HD 3870 ATI RADEON HD 4670 ATI RADEON HD 4850 ATI RADEON HD 5670 ATI RADEON HD 5750 ATI RADEON HD 5770 ATI RADEON HD 5870 ATI RADEON HD 6630M ATI RADEON HD 6750M ATI RADEON HD 6770M ATI RADEON HD 6970M Intel HD Graphics 3000	NOTICE: The following video chipsets are unsupported by Quake 4 ATI RADEON X1000 Series NVIDIA 7000 Series Intel Integrated GMA 950 Intel Integrated x3100 NOTICE: This game is not supported on volumes formatted as Mac OS Extended (Case Sensitive)	NOTICE: Internet connection is required for activation. 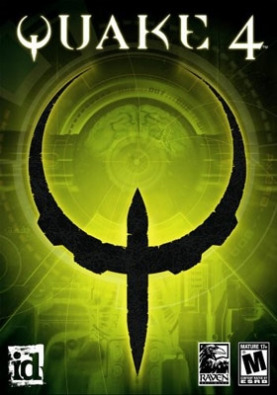 Quake® 4 © 2005-2012 id Software LLC, a ZeniMax Media company. Quake, id, id Software, id Tech and related logos are registered trademarks or trademarks of id Software LLC in the U.S. and/or other countries. Bethesda, Bethesda Softworks, ZeniMax and related logos are registered trademarks or trademarks of ZeniMax Media Inc. in the U.S. and/or other countries. All Rights Reserved. Published and distributed by Aspyr Media, Inc. “Aspyr” and the Aspyr “star” logo are federally registered trademarks of Aspyr Media, Inc. All rights reserved. Mac and the Mac logo are trademarks of Apple Computer, Inc., registered in the U.S. and other countries. The ratings icon is a trademark of the Entertainment Software Association. All other marks and trademarks are the property of their respective owners. All rights reserved.